CELEBRATE THE MINISTRY OF THE REV. LOIS REARDIN: Today we celebrate the ministry of the Rev. Lois Reardin at a special coffee hour in her honor. We would also like to invite parishioners to contribute towards a gift for Lois as recognition of her 17 years of priestly ministry at St. Paul’s. If you would like to contribute towards this gift, please write a check to St. Paul’s and indicate “Gift for Lois” on the memo line. We will continue to accept contributions through the month of April, and will make a presentation at a later service. HERMANO DAY: Next Sunday, April 10, is our annual “Hermano Day.” We will be joined by representatives from the Episcopal Farmworker Ministry. Please bring donations of men’s clothing and bedding to church that day. These items are for migrant farmworkers who have just arrived in North Carolina. Migrant laborers journey here with just the clothes on their backs and live in remote labor camps. The Episcopal Farmworker Ministry in Newton Grove, NC, provides men in 47 labor camps with clothing, bedding, food, medicine, and a Sacramental Ministry. The following donations are needed and welcomed: Men’s work pants (smaller sizes), Men’s long-sleeved shirts (small sizes), men’s socks and underwear, sheets (twin are best), towels, blankets, dried pinto beans, rice, and tortillas. Clothing and bedding can be new or used. Monetary donations are always welcome. Please make checks out to the “Episcopal Farmworker Ministry” and BRING YOUR DONATIONS TO CHURCH ON SUNDAY, APRIL 10. Thank you for your generous support of the Farmworker Ministry. SPRING MINI MINISTRY FAIR: Whether you’re looking to get involved in something new or just want to find out what’s happening, come to the Spring Mini Ministry Fair during coffee hour in the parish hall on Sunday, April 17. Here are some of the ministries who will be on hand: Altar Guild, Fellowship, Memorial Garden, Ministry of Mothers Sharing, Urban Ministries, Refuge for Refugees, Women’s Study Group, and the newly formed Senior Ministry. REFUGE for REFUGEES: Many of you have expressed an interest in meeting the Bariz family, our refugee family from Afghanistan/Pakistan. They are eager to meet you as well to say “thank you” for all you have done for them. 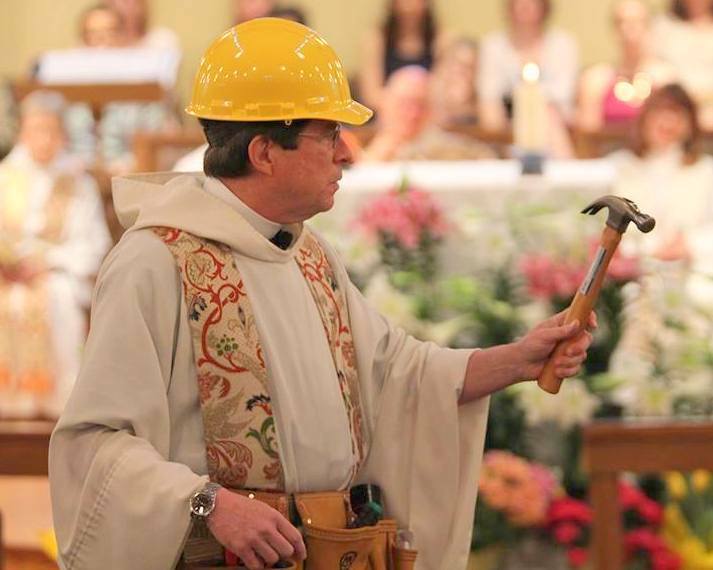 Please come to a reception on Sunday, April 17th, 3:00 p.m., in the parish hall. Cake, coffee, and lemonade will be provided. If you would like to bring some finger foods as well, that would be great! OK! Let’s PARTY! “GOD CALLS LEADERS,” the fourth Bible Study course in the Kerygma “Great Themes of the Bible” series, begins this Wednesday, April 6. Classes are led by the Rev. Dr. Cathy Deats and are held weekly in the youth wing, 7:00 p.m. through May 18. There is a cost of $20.00 per participant for a resource book. To participate in this course, sign up by email to Beth Barnes, eanbarnes@gmail.com, or at the Adult Education display in the narthex. ADULT EDUCATION FORUMS. There will not be a forum today. Forums resume April 10 with the topic “Issues of Poverty and Need in Our Area and Christian Ministry in Action.” Join guest speaker Howard Manning, Executive Director of Dorcas Ministries, in the chapel between the 9:00 and 11:15 a.m. services. COFFEE HOUR MINISTRY HIGHLIGHTS: Coffee hour in the parish hall today will be a special celebration of the ministry of the Rev. Lois Reardin. Please join in this opportunity to express gratitude, share stories, laughter, and refreshments. Next week the Outreach Committee will be hosting coffee hour following the 9:00 a.m. service. Come join them for food and refreshments and to find out more about St. Paul’s many outreach opportunities, including Refuge for Refugees, Wheels4Hope, and Wake Interfaith Hospitality Network. 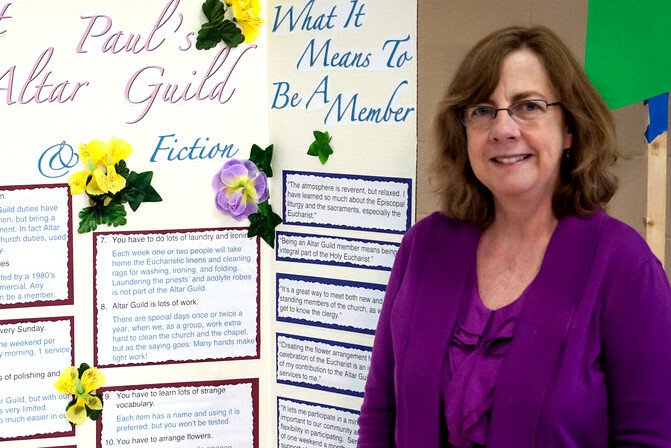 ALTAR GUILD: Susan Hawkins was a long-time parishioner of St Paul’s and dedicated volunteer who participated in many ministries, including Greeters, Ushers, Eucharistic Ministers, and Altar Guild, where she created beautiful flower arrangements to decorate the altar. In honor of her service, the Altar Guild has created a silk floral centerpiece for the narthex. It will remind us of her warm, beautiful, and welcoming spirit. ATTENTION SENIORS – The Center for Hope and Healing has something for YOU! Savvy Seniors, a Lunch and Learn Opportunity, Thursdays, 11 a.m. – 1 p.m. April 7-May 26. Melissa Huemmer, LCSW and counselor at CHH, will guide participants through discussions on topics pertinent to dealing with aging. This is designed to be a fun and helpful experience where people can express themselves and seek information and support in a compassionate environment. Topics will be adjusted to suit the needs of the group, but past sessions have included discussions about Maintaining Social Connections, Having Fun, and Dealing with Fears and Anxieties. Cost is $20 per session (bring a lunch, we provide drinks) and we must have at least six participants to proceed with the group; you do not have to be associated with St. Paul’s to attend – bring a friend!! Please contact Melissa Huemmer at Melissa.Huemmer@chhcary.org or by calling 919-414-0668 to register, or to learn more specifics about the group. COURSES RETURN TO THE CENTER FOR HOPE AND HEALING: “How to Organize Your Personal Finances to Avoid Stress,” Monday, April 11, 7 p.m. at CHH. The American Psychological Association identified money as a somewhat or very significant source of stress for the majority of Americans in 2015. We have asked St. Paul’s parishioner Bill Gautier, a Financial Advisor with Davenport & Company, to give us a few pointers on how to tackle some of that stress by getting organized and putting a plan into action. This course is offered free of charge and will be limited to 25 participants. Please contact Mary Kintz at info@chhcary.org to register or ask for more information. Study Skills for High School and College Exams, Thursday, April 14, 7-8 p.m. at CHH. This workshop will help students identify the tools needed to create a successful study plan for exams. Lori Ghosal, Ed. D, an Academic Coach at NC State Student Services, creates academic success strategies and career plans for students. The course will examine how students learn best and provide strategies that complement learning styles to increase comprehension, critical thinking, and analysis skills to improve test performance! The course is offered free of charge. Please contact Lori Ghosal at lori@innerquestcoaching.biz to sign up, or check out her website at www.innerquestcoaching.biz. Whether you’re looking to get involved in something new or just want to find out what’s happening, come to the Spring Mini Ministry Fair during coffee hour in the Parish Hall on Sunday, April 17. Here are some of the ministries who will be on hand: Altar Guild, Fellowship, Memorial Garden, Ministry of Mothers Sharing, Urban Ministries, Refuge for Refugees, Women’s Study Group, and the newly formed Senior Ministry. Pictures of Holy Week 2016 are posted. Click HERE. St. Paul’s annual Vacation Bible School will be June 20-24 (9:00 AM to 12:00 noon) OR June 22, 23, and 24 (6:00 to 7:30 PM). Registration: VBS 2016 Registration Form. Continue reading for details. Many of you have expressed an interest in meeting the Bariz family, our refugee family from Afghanistan/Pakistan. They are eager to meet you as well to say “thank you” for all you have done for them. Please come to a reception on Sunday, April 17, 3:00 PM, in the Parish Hall. Cake, coffee, and lemonade will be provided. If you would like to bring some finger foods as well, that would be great! Click HERE for more on the Refuge for Refugees Ministry.